This past Saturday, in their home opener against Frostburg State at Shadeck Stadium, the No. 11 Franklin & Marshall Men’s Lacrosse team crushed the Bobcats 20-9, improving their overall record to 2-0. F&M’s Sean Rogers, leading all scorers, scored six points on Saturday and became just the 5th Diplomat to reach 200 career points. F&M’s Luke Keating and Jarrett Donaghy both added three points with two goals and one assist each. F&M’s John Sommi ended with a goal and an assist and F&M’s Ronan Garcia added an assist. Additionally, F&M’s Kevin Mollihan recorded a hat trick, F&M’s George Briggs struck twice, and F&M’s Drew DeBacco, Christopher Casey, Andrew Towne, and Jamie Spruance all scored once. F&M’s Christopher Casey held down the fort on the defensive end of the field, causing three turnovers and three ground balls. 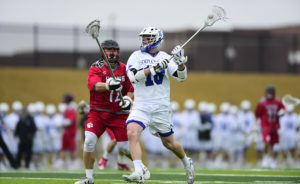 Furthermore, F&M’s Ellis Llewellyn had six ground balls and two caused turnovers, while F&M’s Jarrett Donaghy ended with three ground balls and two caused turnovers. F&M’s Andrew Rose went 15-for-24 from the X.
F&M goalie Scott Hatch picked up the win with nine saves, improving 2-0, while Frostburg goalie, Jack Marks took the loss with 11 stops, falling 1-1. Two goals by F&M’s Sean Rogers in the first quarter were matched equally by the Bobcats, making the score 2-2 at the end of the first. Despite what seemed like a close game for the two teams, the Dips came out strong in the second with seven straight goals to start out the frame, taking a 9-2 lead with 3:52 left. While Frostburg netted a goal at 2:32, F&M’s Kevin Mollihan struck back just before time expired, giving F&M a 10-3 lead at halftime. In the first two minutes of the third, a goal by the Bobcats at 9:09 went unmatched as F&M put two more through seconds afterwards, bringing the score to 12-3. Frostburg State answered with three straight to make the score 14-7, but the Diplomats netted two in the final minutes of the third, heading into the final quarter with a 16-7 lead. Frostburg, opening up the fourth with an early goal, unfortunately was not able to do enough to secure the win. The Dips outscored the Bobcats in the fourth 4-1, and ended the match with a 20-9 victory over FSU. F&M dominated in shots at 50-29, went 17-for-18 on clear attempts, and held a 39-27 edge in ground balls. The Dips travel to Susquehanna Wednesday for a 4:00 PM game and face off against Washington and Lee at 12:00 PM this upcoming Saturday.